A Kodak No. 2 type photograph taken in 1890 by Theodore Mitchell Hastings, Form of 1894, while a student at St. Paul’s School. 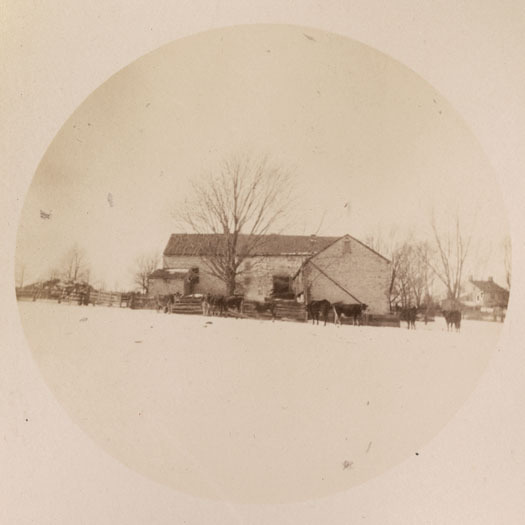 This photograph shows a farm identified as “Abington Farm” in an unknown location. Physical Details: One of eight photos mounted on a preprinted cream-colored paperboard album page with outlines for mounting Kodak No.2 photographs. "Kodak Photographs." printed at the top of the page and "Abington Farm" written in ink beneath the photograph on the album page in the space labeled "Subject". Hastings, Theodore Mitchell. 1890. "Abington Farm." St. Paul's School. Ohrstrom Library Digital Archives. Web. 24 Apr. 2019.